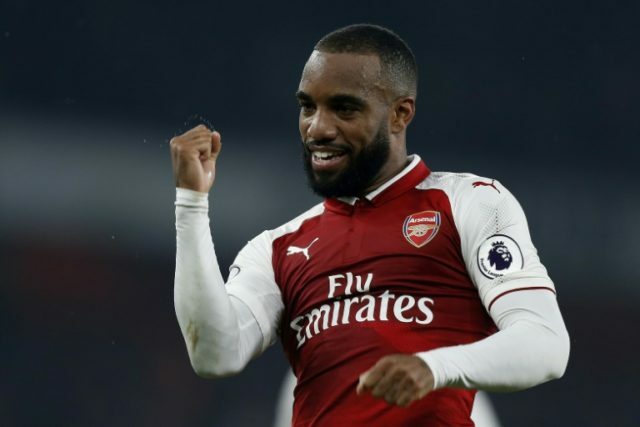 London (AFP) – Alexandre Lacazette stole the spotlight from record breaker Gareth Barry as the Arsenal striker’s double clinched a 2-0 win over West Bromwich Albion on Monday. Albion midfielder Barry broke Ryan Giggs’ Premier League appearance record by playing in his 633rd game, but it was Lacazette who ended the night as the centre of attention at the Emirates Stadium. The France forward opened the scoring with a first-half header and stroked home a penalty after the interval to give him four Arsenal goals since his club record £52 million ($70 million, 59 million euros) move from Lyon. The Gunners are up to seventh in the Premier League after extending their unbeaten run to five matches in all competitions since their humiliating loss at Liverpool. “He gets stronger in every game. Good first touch and movement,” Gunners manager Arsene Wenger said of Lacazette. With Sanchez starting for just the second time this season in the Premier League, it was the first time the Chile forward had been on the pitch at the same time as Lacazette following the striker’s pre-season arrival. It took only seconds for the pair to combine to good effect as Lacazette’s pass put Sanchez into a dangerous position just outside the Albion penalty area. Craig Dawson responded by fouling Sanchez, who took the free-kick himself and fired just wide of Ben Foster’s goal. Barry has never been much of a creative force, even in his heyday, but the 36-year-old almost ushered his side into a shock lead when his sumptuous pass sent Jay Rodriguez into the Arsenal area. Rodriguez cleverly cut back on Shkodran Mustafi and looked certain to win a penalty when he was up-ended by the Arsenal defender. But Rodriguez clambered back to his feet and, with referee Bobby Madley not punishing the foul, the Albion forward unloaded a shot that Petr Cech pushed against the far post before Arsenal scrambled clear. Albion manager Tony Pulis was furious no penalty was given and his frustration only mounted as Arsenal took the lead in the 20th minute. On his first league start since the collapse of his desired move to Manchester City, it felt inevitable Sanchez, making his 100th Premier League appearance, would be at the centre of Arsenal’s opener. Jonny Evans conceded a free-kick right outside the area with a foul on Mohamed Elneny and Sanchez stepped up to curl the set-piece goalwards. Foster managed to tip the shot against the crossbar, but Lacazette alertly followed up to head into the empty net from close-range. The absence of Mesut Ozil, languishing on the bench after being ignored by Wenger, was hardly noticed as Sanchez went close to doubling Arsenal’s lead with a low free-kick that flashed wide. But Albion immediately raced down the other end and should have equalised. Rodriguez met Grzegorz Krychowiak’s cross with a far post header that beat Cech, only for Nacho Monreal to scamper back just in time to acrobatically clear off the line. Albion went close again before the interval when Barry’s shot was pushed out by Cech and Rodriguez scuffed wide. Pressing for a killer second goal after the interval, Lacazette saw his shot deflected wide off former Arsenal defender Kieran Gibbs. Arsenal’s dominance was rewarded in the 67th minute when Aaron Ramsey surged past Allan Nyom on the touchline and the Albion defender responded by barging over the Welshman. Madley pointed to the spot and Lacazette clinically dispatched the penalty. Lacazette could have bagged his hat-trick in the closing stages but, despite his wayward finish, Arsenal were already home and dry.